Of all the woodland mushrooms and toadstools found in Britain and Europe, the genus Amanita arguably includes not only the best known but also the most notorious of species. The Amanita genus also includes what many people consider to be the most beautiful or stately of mushrooms. Unlike some of the other commonly-encountered genera, the Amanita group contains a manageable number of species in Britain and Ireland: some 50 species of which only about 15 are common and widespread. If you are new to fungi identification but would like to become good at it, avoid the trap of simply looking through pictures and choosing the 'closest fit'. It may work sometimes but you will have more misses than hits, and what's worse is that it in no way helps you to become really competent. Only by assessing a whole range of features (mycologists use the term 'characters') including physical size, shape, texture, colours, smell and taste plus growing habitat can you compare a mushroom that you have found with the official description accepted as typical for the species. 'Difficult' species may require microscopic examination of spores, but for most the common amanitas we can get by with macroscopic characters (visible without a microscope). Amanita mushrooms generally have very distinctive characters, and for the most part they tend to vary rather less from specimen to specimen than mushrooms in some of the more 'difficult' genera. The word genus refers to a group with a number of 'general' features in common. 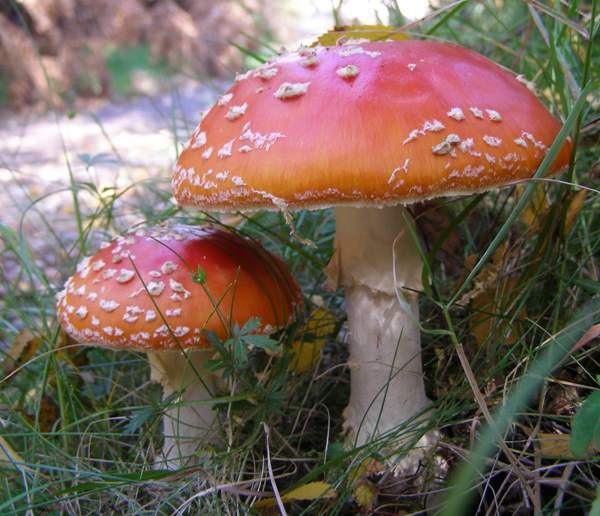 Here are some of the features generally associated with fungi in the genus Amanita. They grow on soil (not directly on wood) but always with mycorrhizal associations (symbiotic or mutually beneficial relationships) with trees. This means Amanita mushrooms will always be in or beside woods or at least hedgerows. They all have pale (nearly always while) gills that terminate before reaching the stem . They leave white spore prints. 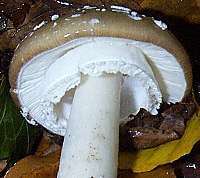 The cap of an Amanita is easily separated from its stem. Their caps feel dry rather than slimy. Many have pieces of universal veil attached to their caps either as warts or irregular patches. Most but not all have a membranous ring of the stem - remnants of the partial veil that covers the gills when the mushroom is immature. Most have visible remains of the universal veil attached to the base of the stem, often as a bag-like 'Volvo' or as saucer-like gutter or spiral rings at the top of a swollen or bulbous stem base. Microscopic characters include either amyloid or inamyloid (but never dextrinoid) spores, and gill tissue that is divergent rather than parallel or interwoven. Immature mushrooms may not display all of the features that become apparent later when the cap has opened up fully. Finding both immature and mature specimens together is therefore very helpful. Use a knife to dig out the underground stem base one of the mushrooms so that you can check its basal features. Note whether the bottom of the stem is bulbous or parallel; whether there is a volva and if so what are the colours of the inside and the outside, and whether any volva is flexible or brittle. Check for any rings around the base of the stem. 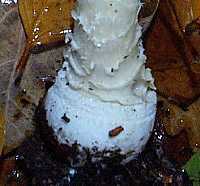 The stem base shown above is from a Panthercap Amanita pantherina, which has two or more rings girdling the lower stem. Check to see if there is a stem ring, and if so is it is thin and fragile and/or incomplete or chunky and substantial. Don't assume it's not an Amanita if there is no stem ring, though: there is a small group of amanitas commonly known as the 'grisettes' that do not have a stem ring. Some stem rings are chunky and hang downwards in a very neat and distinctive way, as is the case with fresh young specimens of Amanita pantherina, shown above; others remain intact only for a brief period, and if you find an aged specimen its ring might have disappeared almost entirely, although if you use an eyeglass to inspect the upper stem you might at least be able to find a few fragments as evidence that there was a ring. Don't do taste test on any Amanita-like mushrooms, because there are some deadly-poisonous fungi in this genus and even a tiny taste could be disastrous. One or two species have distinctive smells, especially when they become fully mature, so make a note if there is a particular small associated with your specimen. Crushing gills between (clean!) fingers will make the smell more obvious; alternatively, store a piece of cap in a sealed plastic box for a few minutes, and when you open the box any odour should be very much more evident. Dichotomous keys present a series of two-option decisions leading ultimately (if all goes well) to the most likely species identification. Thereafter you still need to check the the characters of your specimen against the detailed species description. If the characters do not match,either you have made a mistake while using the key, or the key is imperfect (not unusual) or you have found a species not covered by the key, or (not with this Simple Key but when you are using the most up-to-date and comprehensive of keys) you have perhaps found a species new to science - it does happen! If you have arrived at 'Not in this Simple Key' it is likely that you have found one of the less common Amanita species that occur in Britain but are not included in this simple key. Some of the rarer species can be seen in our Amanita Gallery and their detailed descriptions are included on pages on this website; however, for comprehensive coverage of all Amanita species currently recorded in Britain we recommend Geoffrey Kibby's specialist key (see references, below), which is available as a printed book.